Steel, the most commonly used material, corrodes in many media including most outdoor environments. When unalloyed or alloyed steel without corrosion protection is exposed to the atmosphere, the surface takes a reddish brown colour after a short time. This reddish brown colour indicates rust is forming and the steel is corroding. While corroding the steel is getting oxidized to produce rust, which occupies approximately 6 times the volume of the original material consumed in the process. The corrosion process begins when a corrosive medium acts on the steel. The corrosion can be either chemical corrosion or electrochemical corrosion. Besides general corrosion, there are various types of localized corrosion that can also occur. According to DIN EN ISO 8044 there are the following types of corrosion. Uniform surface corrosion – It is the general corrosion occurring on the entire surface of the steel at nearly the same rate. Shallow pit corrosion – This is the corrosion with locally different corrosion rates caused by the existence of the corrosion elements. Pitting corrosion – It is a form of localized corrosion of steel surface confined to a point or small area that takes the form of cavities. Pitting corrosion is one of the most damaging forms of corrosion. 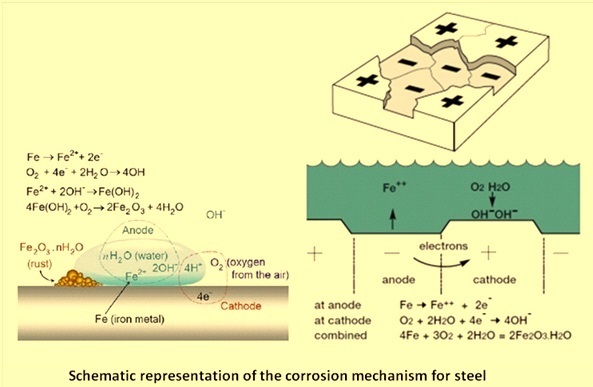 The driving power for pitting corrosion is the de-passivation of a small area, which becomes anodic while an unknown but potentially vast area becomes cathodic leading to very localized galvanic corrosion. The corrosion penetrates the mass of the steel, with limited diffusion of ions. Crevice corrosion – It is a localized form of corrosion usually associated with a stagnant solution on the micro-environmental level. Such stagnant microenvironments tend to occur in crevices (shielded areas) such as those formed under gaskets, washers, insulation material, fastener heads, surface deposits, disbonded coatings, threads, lap joints and clamps. Crevice corrosion is initiated by changes in local chemistry within the crevice such as (i) depletion of inhibitor in the crevice, (ii) depletion of oxygen in the crevice, (iii) a shift to acid conditions in the crevice, and (iv) build-up of aggressive ion species (e.g. chloride) in the crevice. Bi metallic or contact corrosion – In case of bi metallic or contact corrosion, corrosion occurs when steel is coupled together with another metal different potential and together both are contained in a conductive electrolyte, current will flow and corrosion will commence. Current will flow from the metal with the greater negative potential through the electrolyte to a metal that is more positive. Corrosion will occur at the point where the current leaves the metal surface. This corrosion is also referred as galvanic corrosion, dissimilar metal corrosion or contact corrosion. Intergranular corrosion – In the case of inter granular corrosion, corrosion take place in or adjacent to the grain boundaries of the steel. ?Mechanical wearing as well as static or dynamic stresses often act in combination with corrosion. The main categories for combined effect of mechanical factors and corrosion are as follows. Stress corrosion – stress corrosion occurs when a metal in a corrosive environment is exposed to static stress that results in fracture. Corrosion fatigue – corrosion fatigue is caused by the combined effect of corrosion and varying state of stress. Erosion corrosion – erosion corrosion is an acceleration in the rate of corrosion caused by high velocity of a liquid, or solid impurities carried by a liquid. Cavitation corrosion – cavitation corrosion is erosion caused by the combined effect of corrosion and the pressure caused by the breaking of gas bubbles formed in liquid (cavitation). The rate at which the corrosion process progresses depends on a number of factors relating to the ‘micro-climate’ immediately surrounding the structure, principally the time of wetness and the atmospheric pollution level. Because of variations in atmospheric environments, corrosion rate data cannot be generalized. However, environments can be broadly classified, and corresponding measured steel corrosion rates provide a useful indication of likely corrosion rates. The atmospheric corrosive categories are given in Tab 1.
a -The thickness loss values are after the first year of exposure. Losses may reduce over subsequent years. The following basic determinations are required for the avoidance of corrosion damage. Determination of the corrosion exposure of the steel product, the plant, the steel structure or the steel building. Knowledge of the service life period of time in which the corrosion system meets the requirements for functionality. The determination of the corrosion exposure is relatively difficult since both the influence of the climatic zones, the local climate, the atmospheric types and the microclimate need to be taken into account. A corrosion protection corresponding to the service life has to be determined in order to minimize the expenses for costly repetitive maintenance measure. All measures, methods and procedures aimed at the avoidance of corrosion damages are called corrosion protection. Corrosion protection consists of modifications of a corrosion system to minimize the corrosion damages. Different corrosion protection methods are used to protect the steel from corrosion. These are described below. Active corrosion protection – In the case of active corrosion protection the aim is to influence the reactions which proceed during corrosion and by it to control not only the package contents and the corrosive agent but also the reaction itself in such a manner that corrosion is avoided. Active corrosion protection helps reduce or avoid corrosion by means of manipulation of the corrosion process, corrosion material selection, project engineering, design and manufacturing. Development of corrosion-resistant alloy steels and the addition of inhibitors to the aggressive medium are examples of such an approach. Passive corrosion protection – In the case of passive corrosion protection, damage is prevented by mechanically isolating the package contents from the aggressive corrosive agents. Examples are use of protective layers, films or other coatings. Since this type of corrosion protection does not change either the general ability of the package contents to corrode or the aggressiveness of the corrosive agent. Due to this reason this approach is known as passive corrosion protection. In this approach, corrosion may occur within a very short time if the protective layer, film or other coatings is destroyed at any point. The passive corrosion protection can be either permanent or temporary. Examples of permanent passive corrosion protection methods are tin plating, galvanizing, coatings with protective materials, enameling and plating. Examples of temporary passive corrosion protection methods are protective coating methods (Both solvent based and water based), desiccant methods and VCI (volatile corrosion inhibitor) methods. Sacrificial protection (cathodic protection or galvanic protection) – The reaction between dissimilar metals is sometimes used to protect steel against corrosion. The most widely used metal for the protection of steel is zinc. Zinc metal in direct contact with the steel substrate offers protection through the preferential oxidation of zinc metal. Zinc is a great choice in protecting steel, as not only does it corrode in preference to the steel, the rate of corrosion is generally slower. This rate, however, is accelerated in the presence of ions such as chlorides in coastal locations.